Fear of driving is a very common and we understand it is very important to provide the right atmosphere for our students. That's why we have a no shouting policy. Creating a learning environment like this starts with us and our instructors. Which is why our instructors get that little bit extra training above the standard you'll usually see out there. Our instructors are passionate about teaching people to drive and work hard to give you the ultimate driving lesson experience. In the end that is what being a driving instructor is all about. 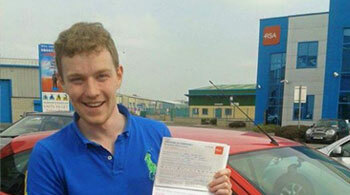 You, your needs and affordable quality driving lessons in Moyvane. This is just one initiative that sets us apart from the competition in Moyvane. We have seen pupils learn 3-4 times faster with our home study training. Lessons come and go fast and it is easy to forget what you have learned. Our extra lesson material means you can follow up on what was covered before the next lesson ensuring you don't waste time and money going over the same things. We all remember the exciting engaging teacher at school that made learning easy and fun. And we can recall the poor teachers that had no business teaching anyone. Not all teachers are made equal and that is no less real with approved driving instructors. It's not as simple as Googling 'Driving Lessons Moyvane' and picking the first driving school you find. Who can you have faith in to offer you that fun and engaging experience? RSA School of Motoring have the precise track record of student success we have been talking about and we have the verified testimonials to show it. So if you need driving lessons you would be getting a head start choosing us. Let us show you why. First you must master the rules of the road, the road signs and skills involved to control a car safely. And then there is learning to pass the driving test. Being allowed to drive by yourself on Moyvane roads is a right you will need to earn and the driving test is your opportunity to do it. And naturally, as with any test, if you understand the conditions and what to expect you can pass easily. Check out pretest packages in Moyvane here... or Call 061 574 797 now to book your pretest package. If you want to learn to driving an automatic in Moyvane then you're not alone and we can help. Give us a call today and we’ll get you booked in with your nearest automatic instructor. Do you want to do your Kerry driving lessons with a lady instructor? Your wish is our command. You can take your essential driver training or pretest lessons with one of our female driving instructors. Just give us a call to book in. Certainly. We understand that young people these days live very busy lives so as part of our service we include free pick up and drop off from your Moyvane home, college or place of work*. Got anymore questions for us? Our Moyvane driving instructors would be proud to teach you to drive so call us today. You'll be very glad you did.